Letters, the foundation of our literacy, the beginnings of our intellectual technology, lead the way in the study of history and art, traditions of the intellectual life of people on earth. The western Roman alphabet, A to Z, reached a design pinnacle with 23 letters in second century Rome. For 2000 years the identifying shape, with the addition of “J,” “U,” and “W,” of the Roman capital letter, has not changed. Calligraphers, type designers and font designers for computers have all played with the form, added swirls and embellishment and made manifest the letters with many different tools. Through the years powerful human creativity has played with the letters, but they have not changed. New alphabetic styles are designed, and inside all, holding true, are the letters A to Z. The letters are symbols, and they represent sounds. How simple and elegant and infinite in possibility! The letters themselves, the twenty-six letters of the Roman alphabet, combine to make written words and allow us to capture statements and thoughts for later review. The letters take on substance when we put ink on paper, and they can be written with different energies to convey peace, anger, love, haste – they became an art form addressing the soul. 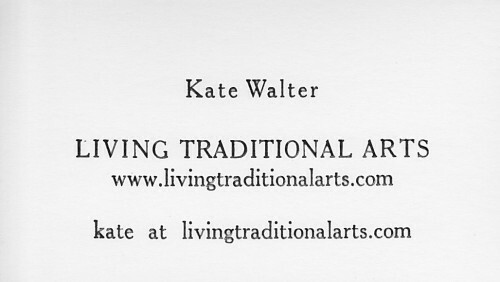 I met this art form as a child, daughter in a household of artists and encouraged to use the tools that were kept in our home. Once I discovered my mother’s pens, I was hooked. Pens, paper, and black ink. The pen nibs were interchangeable, and the variation in line and style pleased me. I became a student of calligraphy. It is not a long leap from love of the handwritten letter to love of the printed letter, and when I met the printing press I stepped right up and reveled in the production of piece after piece of printed design coming off the press in duplicate. Humans have been making and enjoying art prints for a very long time, and one can only imagine the scene of the very first hand print. Early printing presses produced relief prints – the printer rolled a layer of ink on the design, often carved out of wood, and then pressed it onto a piece of paper. Woodblock. Those presses go way back— we know that in China people were printing with presses as early as the third century A.D.
By the eleventh century, the Asians had devised moveable type, using wood, ceramic, and metal, and in the mid fifteenth century the technology of movable metal type was advancing in Europe with Johannes Gutenberg and others devising the press, papers, inks and a system of moveable metal type that enabled the printing of books in the Roman alphabet. A type stick, quoin key and type locked in a chase, on the stone. Moveable type, type that is molded in individual letters to be used over and over again in different documents, required a metal with certain qualities of strength and malleability. Type is made of a lead alloy devised by those mid-fifteenth century innovators,. Letterpress. In college, studying typography, I set type for book projects, putting pieces of type together letter by letter to make words and paragraphs. Composing stick in hand, I stood in front of the job case, and I had plenty of time for pondering. It took a lot of time to learn to set type accurately, increasing in speed with practice, and it took a lot of time to set a page. As I worked with the type, beautiful, fragile, easily misplaced and fumbled, I could feel time slowing down. I thought of the typesetter’s life, the possibilities of lead poisoning, the nature of the job that depended on projects with beginnings and ends and limited resources. I thought about the elegance of the type case, with the letters laid out in a very efficient arrangement, but eventually I got around to thinking about how slow the process was. Reasons for inventing typesetting machines became very clear to me. Innovations in the printing world moved along quite quickly, once printing moved away from handset moveable type, and shortly after the typesetting machines came along the printing industry moved to photography and then very quickly to computer technology. When we invited electricity to take charge of our written communication, the letter form moved back out of substance and now exists as a digital file some place, I guess. Is it closer in being now to the sound that it symbolizes? A question I could perhaps ponder next time I have a chance to set type. 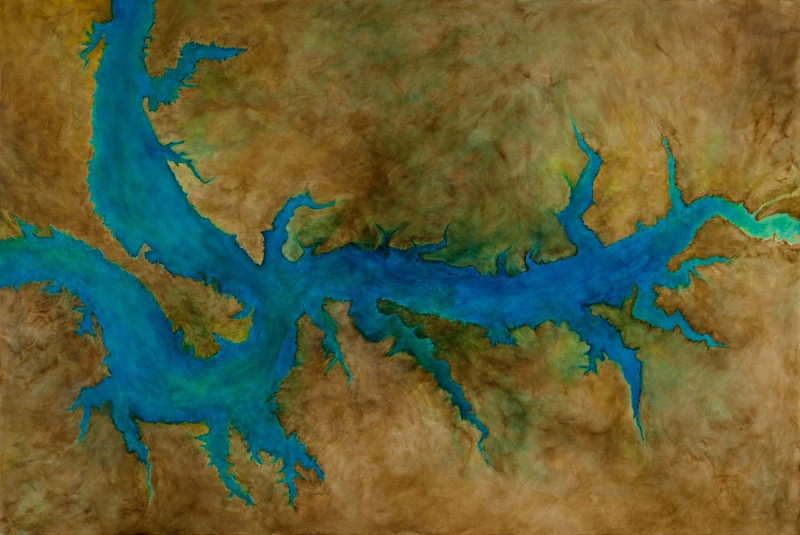 Throughout the variations we have now for communication from one person at one time and place to another person in another place and possibly another time, the artistic being of the letter remains an informing part of our communication. 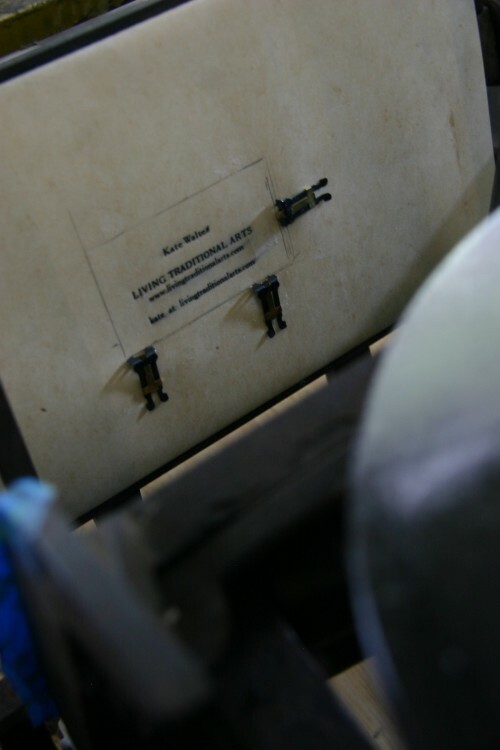 The quality of the letterpress print stands apart from that of the lithographic offset print and the computer laser and inkjet prints, where ink is laid on the surface of the paper creating a more single dimensional print. The letterpress print has depth, it makes a slight physical impression in the paper that reveals the letter even without ink. 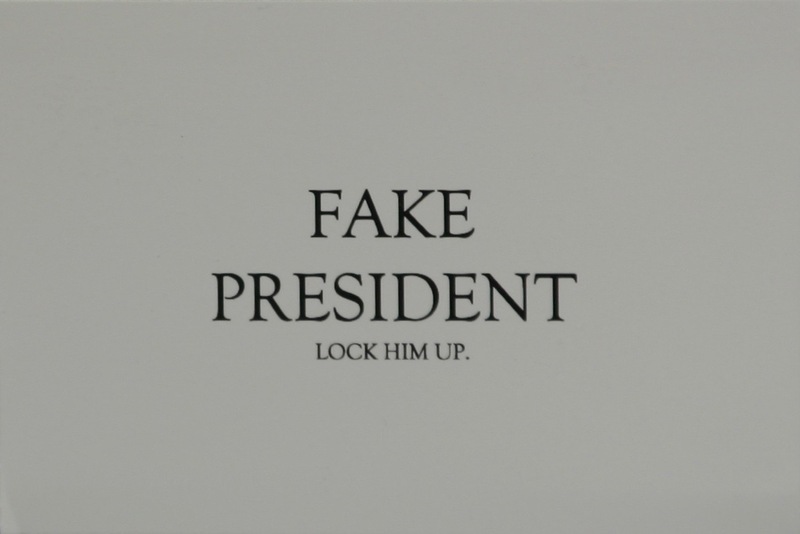 When the letter is printed with ink it has color and dimension, and while the color is primary to other printing techniques, dimension is not there. Read a book printed letterpress, and you actually enter the page, your eye can follow the type into the paper, and your experience, whether or not you consciously recognize the feeling, reflects the dimension of impression. 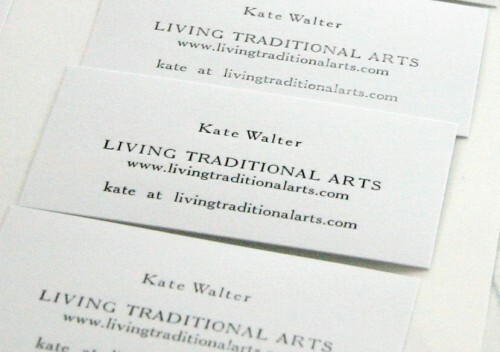 Today letterpress printing, left behind by modern high speed printing, has a capable and devoted following of printers and artists who recognize the rich qualities and possibilities of the craft. 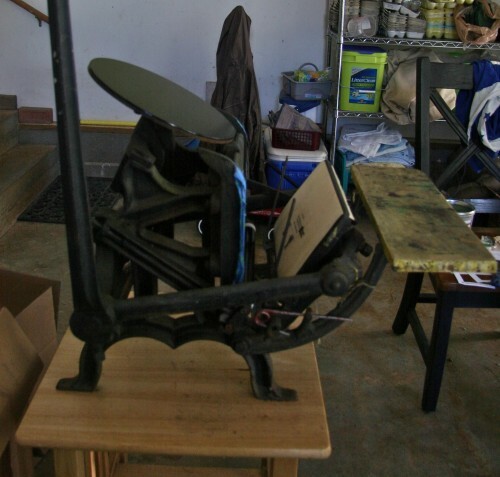 I have an intermittent history with the Chandler and Price platen press and have printed on more than one of these beautiful old machines. Made of cast iron, they weigh more than 1500 pounds, and they require a solid floor and rather a sedentary lifestyle. At the moment, I have no press. My daughter, however, added an old C & P tabletop letterpress to her studio and uses it for art projects that require the special look of the letterpress print. On the move herself, she stores her press in her mother-in-law’s garage. So one hot summer day I set up the print shop. Amanda has all the necessary pieces, a complete printing kit, and she pulled out two boxes with the composing stick and the ink and the furniture and spacers and locking up materials all in neat storage. She had two sizes of type, purchased I believe for wedding invitations, and she had devised a type case from a plastic craft box. I was in business. Type is so small, and so backward. Given that the letters need to print in a positive orientation, the type itself faces the opposite way; there was an odd quiet kind of exhilaration in spelling out words and watching them settle upside down and backward in the type stick in my hand. It felt good to be setting type again. 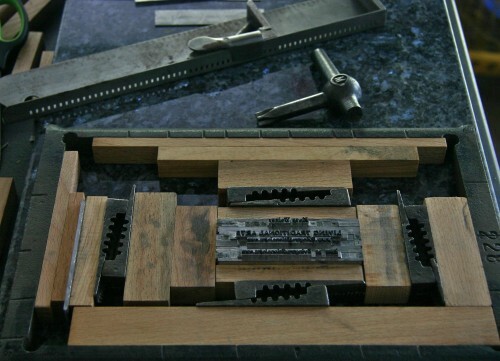 The type stick, known also as the composing stick and the job stick, is a tool specific to printing that allows the typesetter to hold completed lines of type in the left hand while building on the lines, type piece by type piece, with the right hand. It is a perfect design. A little metal right angled half-box, it settles comfortably in the hand, puts the thumb into a natural and key position to hold the type as it is laid into the stick, and it just feels good, secure. 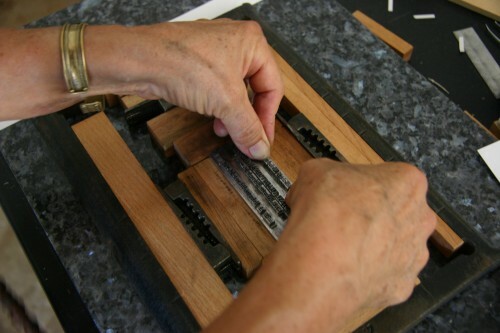 The type stick will hold only a few lines of type, so once those lines are in place, with all needed letters set one by one in the stick, the lines are transferred most carefully to a flat surface for securing of the type, which will soon be taken from the horizontal to the vertical where it will gently move back and forth, rolled over by an ink roller and then pressed into the paper for the goal: the printed impression. When type leaves the stick it goes to the galley, a special tray, where it is tied with twine for safe keeping; when there is a complete page of type on the galley, the galley is moved to the chase, a rectangular iron frame. When all is composed and locked up in the chase, it is called a form, ready for the press. Moving the tied type to the form stage is called imposition, and it requires a large flat imposition stone. The person who does that part of the work has a print shop title: the stoneman. It important that the surface for imposition be flat, because it is important for all printing surfaces to hit the paper with equal force for an even impression. Amanda had a nice piece of marble, a perfectly flat stone, which I used to lock up my form. Using the quoin key, I adjust the pressure of the expandable quoins against the furniture. The goal is even pressure on all sides, with the lines all being the same length and the furniture, the wooden or metal pieces that hold the type in the chase, set in to hold both vertical and horizontal lines of pressure. The type needs to be held firmly, but not too tightly, with enough pressure that the type is neither too loose, allowing pieces to fall out, or so tight that arching occurs. There is a tool, the quoin,that sits between the chase and the furniture. When you expand the quoin with the quoin key, the expanding pressure holds the form in place. I test each line of type for snugness in the form. 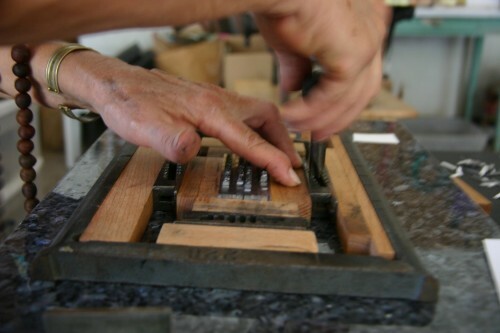 Letterpress printing steps require a slow pace, and all have vocabulary around them that contributes to the warmth of a shared traditional art. If you are clumsy and knock over a drawer or if you move too fast transferring type from one place to another, you might end up with pied type, type spilled all in a jumble, and there is nothing worse than pied type. Type out of order is called broken matter, and to clean up broken matter, you must pick up and examine each piece. You have to orient it, get the face turned toward you, and then you have to reverse it in your mind, all the while looking for the slight dents that might disfigure a piece of type in a spill and make it no longer suitable for printing. Once you recognize the letter, your hand takes over sorting and the type goes to its place in the case, a drawer designed specifically to hold type in good order for typesetting. Each letter has its place, and once the hand learns the position of the letter places, it can let go of the brain a bit. Amanda’s table press works entirely by hand, and before I clamped the form onto the press bed I put ink on the platen and moved the rollers to get an even spread of ink. Then I clamped the form onto the press bed and marked the tympan, the special heavy paper that provides cushion and holds additional packing for the print. I needed to know exactly where the type hit the tympan so that I knew where to place the gauge pins that hold the paper in place to receive the print. 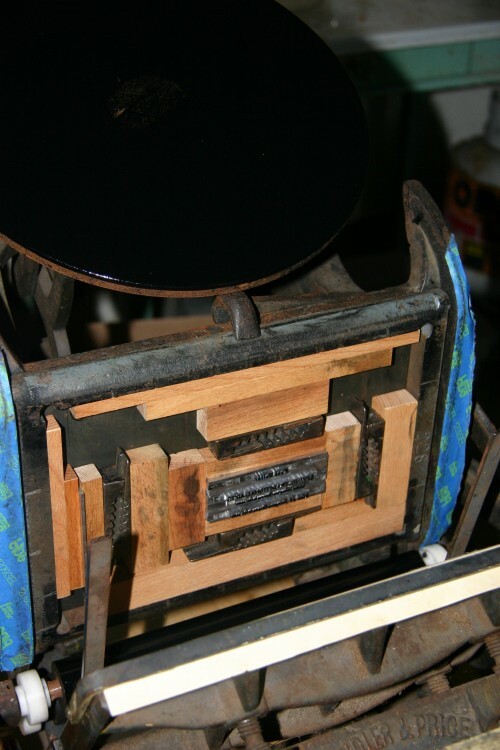 The platen has ink, and the form is clamped onto the bed of the press. 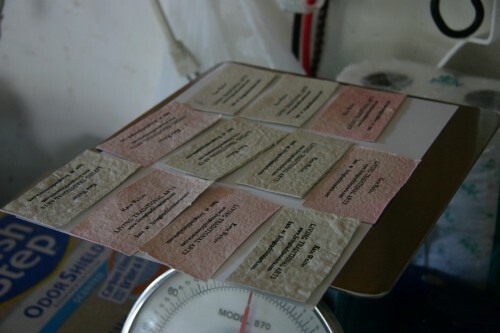 It is important that the pins be set straight and firmly in the tympan, and it is important that the packing, the additional sheets of paper under the tympan, be brought up to provide just the correct amount of pressure to make a clean and not too deep impression when the type hits the paper. The gauge pins will hold the card to receive the printing impression. With all in place, I set a piece of paper on the gauge pins and pulled the bar to make a print – the proof. Careful look at a proof can reveal mistakes, a text not square with the paper,for instance, or a text that is too light, or too dark, or not even. After setting and testing and resetting and testing again, pulling proofs — when all is square and all the letters are evenly printing, then, the run begins. Then I could print card after card, as long as I had paper and ink and as long as I felt like setting in the paper and pulling the bar, plunk, lovely, and pulling the cards out, one after the other all the same. I set the cards out to dry on trays around the garage. In my old printing days I bought boxes of cardstock and printed batches of cards, 500 on order. For this project I had an envelope of cleverly scored cards on punch out pages from the office supply store, made for computer printing and very handy indeed for small jobs on the letterpress. Cards printed on hand molded paper, set to dry on a tray. 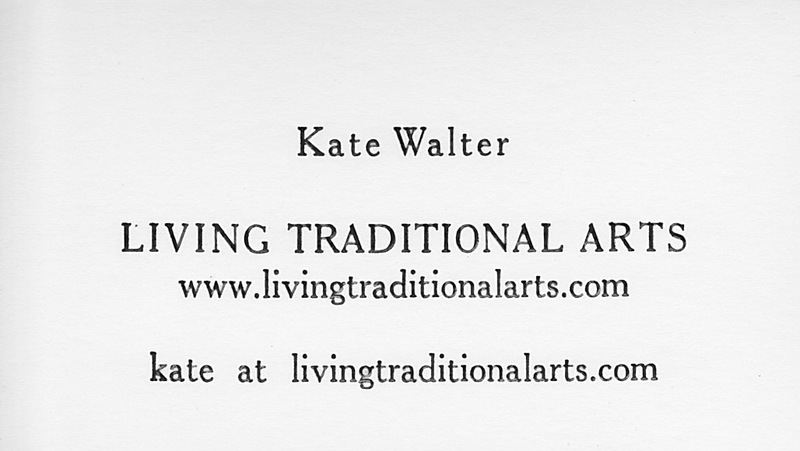 I printed a few cards on hand molded paper from a project some years back at the Pima Street Studio. The rough paper created roughness in the print edges, rather appealing but not as satisfying to my printer’s eye as the black and white of the card stock. I’m happy with each little card, a fine humble way to get out the word.